Beads are now setting pace in the fashion industry and for fashion conscious ladies, they have become a must, without which dressing would not be complete. Beads in different designs are jewelries that are trending now, as many women, including socialites, now prefer them to other types of jewelries. As a result, many discerning ladies are venturing into the business, churning out adorable designs and making good returns from the business. A two-month training for this craft costs about N20, 000. After the training, you can start raking in money, depending on the type of beads you do. For example, there are beads for N1, 000, while there are those for even N80, 000 and above. The amount you make depends on your expertise, creativity, the types of beads you use and your customers. Bead-making is a very lucrative business and it has a lot of money making potential as long as you know your art and your target market. Beading does not require a lot of space or significant technical training, which means you can do it right in the corner of your home. Unlike some other enterprises, it is important to undergo training, as this will give would be entrepreneur more experience and edge in the business. There are schools set up by government where one can learn business like this. You can as well prefer a private school or even learn from an established bead maker, whichever one suits you best. The experience will enable you to make different patterns, which will probably make you unique in the business. You can also expand your investment by selling all these beads making accessories. The advantage here is that you will be able to get your items cheaper and get opportunity to display your products to other people that will be patronising your store. You can also offer training opportunity and still make cool cash as there are lots of people who want to learn how to do it, either for their personal use or for business. One of those people you can offer training to are students during holidays as some of them are now interested in one form of empowerment or the other outside the school curriculum. • Tiger Tail Beading Wires: It has different colors in it and the length is about 10 mm and are sold for about N5000. • Lobster Claw Clasp: This is a hook used at the tip of finished bead work to hold the bead to the neck and cost around N2000. • Packs for Beads: This is meant for packaging of finished beads for customers and they come in two ways either nylon pack or carton packs. Nylon packs contains 100 pieces while contains 50 pieces. Cost between N1000 – N3000. Undertand that nobody wants to own something which is broken or low on quality. The quality of your product will decide if in future the same customer will come back to you. And the customers who come back are the ones who will build a good client base for you. So don’t compromise with the quality. Pricing is probably the most crucial factor in selling jewelry because we all know that a price tag can be a turn off or turn on for a customer. 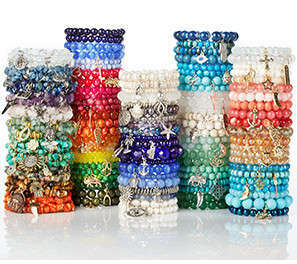 Set realistic prices for your beaded jewelry taking into account bead cost, findings, stringing material, transport cost, packaging material and lastly the most important one of all, the labour cost. Once you have decided on the price then you have finished ten percent of your job. The packaging holds the same significance as branding, building a good corporate image for your products. Yes, an attractive looking package will draw attention. A necklace in a box or a goody bag look much more attractive than in a plastic cover. Do you agree? So spend some time on packaging your jewelry as well. This will be an added bonus. Taking your business online by simply creating your website will say much about the goods you sell. You can also display your works which is the main driver of customers because they will like what they see and this bring more patronage. You can reach out to more targets by simply using Facebook Adverts. People now dwell online and online ad is one of the most effective way in reaching out to targets these days. Once your product is sold, give the customer your contact card along with the package. This will ensure that your customer comes back to you for more if needed and spread a good word about you as well. Keep an eye on all the craft shows/holiday sales around your neighborhood and make money. This is probably the most easier and stress free way to do it. Your workplace is filled up with potential clients! All you need to do is let your colleagues know that you make jewelry and are ready to sell. Send a mail to all your friends asking them to meet around lunch time or after working hours in your cafeteria or some other convenient place (this is of course keeping the office policy rules in mind) and show them your items. If they like it they will buy it. You don’t have to worry about shipping, payment or even delivery. This is because you meet your office colleagues everyday and communicate with them on daily basis. Simple isn’t it? Before you know your client base would’ve increased tenfold and orders will keep coming. There are many boutiques, shops, all-in-one stores which sell jewelry. A shop which sells women’s clothing will indeed have a jewelry section. You can introduce yourself to such shops and ask them to sell your products. This of course will require that you would have to share out a commission to the shop but that will only prove to be a blessing in disguise. The amount of publicity your product will get in a shop will be unbeatable. All you have to do is make beaded jewelry and supply it to the shop. This way you can keep your brand name and do not have to do the marketing. But you must be ready to explore multiple shops because of competition. Nigerians abroad are also good potentials for your products as most of them love dressing in the local fabrics and can you the beads to accentuate their dressings.